We’ve come up with a very attractive yet simple Low Carb Red Velvet Fat Bombs recipe. And they contain only 1g net carb. Our Low Carb Red Velvet Fat Bombs make an excellent keto snack for those on a Ketogenic Diet. They’re delicious and loaded with energy boosting fat. Make them in batches and refrigerate. 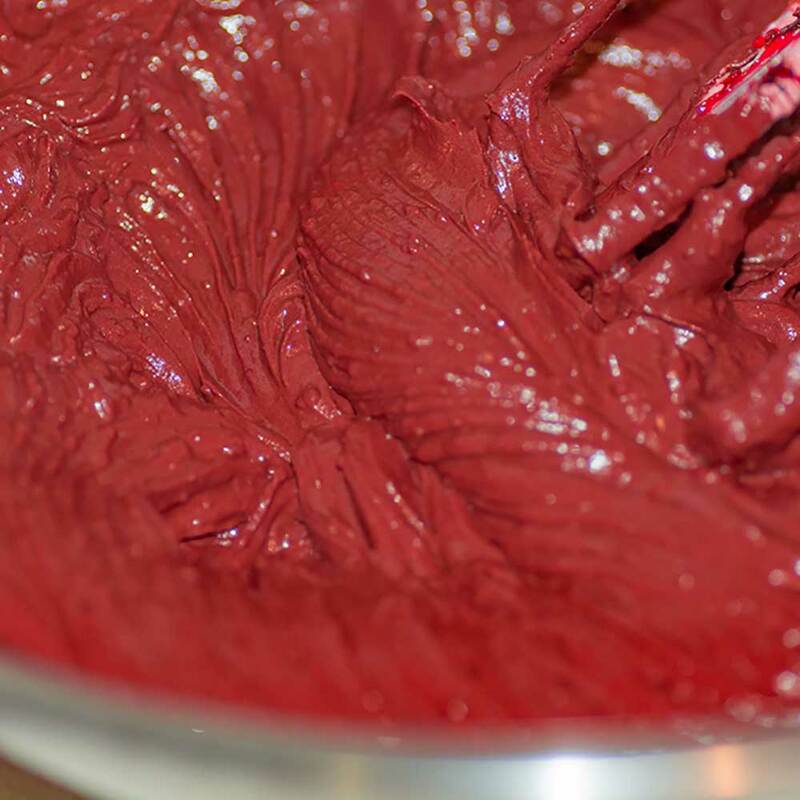 We recommend using a natural, organic, beetroot based, food coloring. 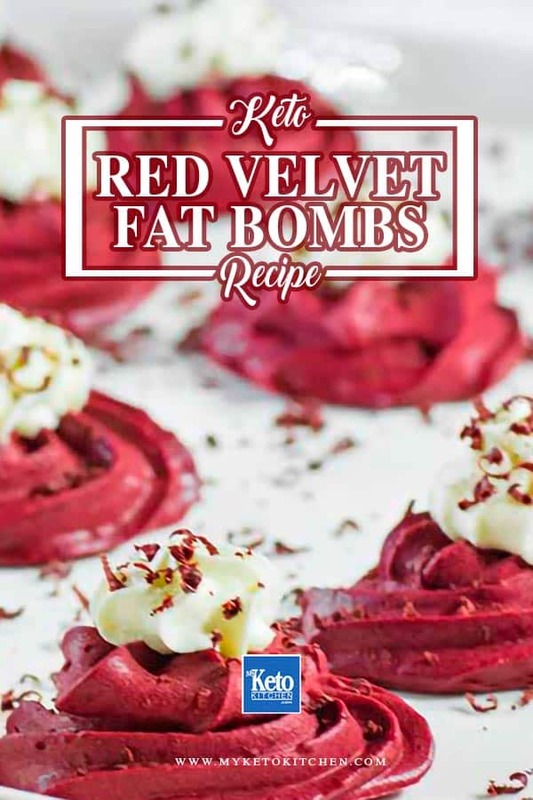 Not only because it’s beetroot base food coloring is a non-chemical option but it also provides for a deeper richer color of red for the red velvet fat bombs and other low-carb recipes. The cream adds an attractive contrast in color and flavor and is also a low-carb, high-fat ingredient. Melt the chocolate in a heatproof bowl over a small pot of simmering water. Make sure that the bowl isn’t touching the water, as this will cause the chocolate to burn. While the chocolate is melting, mix together the remaining ingredients with a Hand Mixer on medium speed for 3 minutes. Ensure the mix is fully combined. With the Hand Mixer on low speed, slowly add the chocolate mixture to the other ingredients. Mix on medium speed for 2 minutes. Add the mixture to a Piping Bag and pipe the fat bomb mixture onto a lined tray. Set in the fridge for 40 minutes. Serve your Red Velvet Fat Bombs along with our Low Carb Vanilla Strawberry Fudge and our Lemon and Poppyseed Fat Bombs and your party will be a guaranteed hit with your friends. Red Velvet isn't as hard to create as you might think. 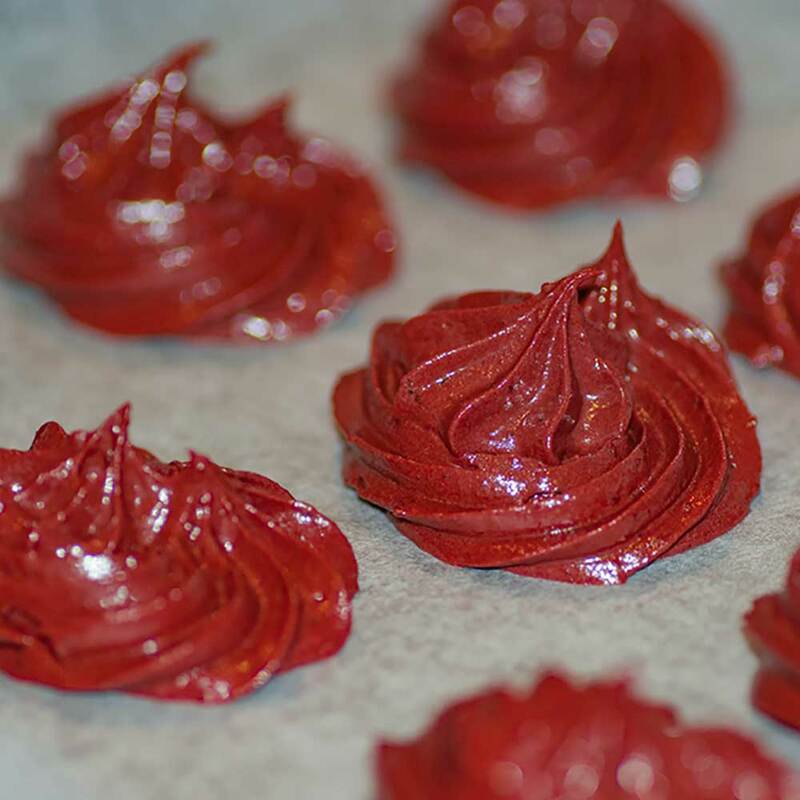 We've created a recipe for simple Low Carb Red Velvet Fat Bombs with only 1g net carb. Melt the chocolate in a heatproof bowl over a small pot of simmering water. Make sure that the bowl isn't touching the water, as this will cause the chocolate to burn. Add the heavy cream to Whipping Canister and apply whipped cream to the fat bombs as pictured. 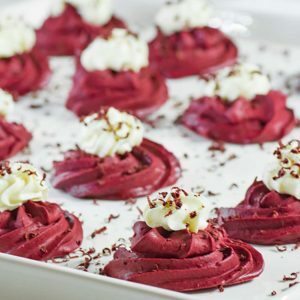 Easy to make Keto Red Velvet Fat bombs recipe. Low-carb, no-sugar snack with basic ingredients that is very easy to make. To make more low carb Red Velvet Fat Bombs or change the measuring units to US Imperial, simply adjust the interactive recipe card above. Keto Garlic Aioli Recipe – “Naturally Low Carb” – Homemade Flavored Mayo!